Cronum's Castle is an Eamon adventure written by Matt Ashcraft and Richard Tonsing for the PC. 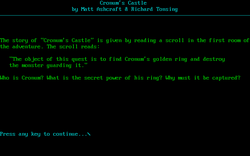 Cronum's Castle is the second original module written for Jon Walker's port of Eamon to MS-DOS. Its authors were a father and son team—Richard Tonsing being the father of the then-eleven year old Ashcraft—who entered their adventure to public domain distributor PC-SIG's 1987 "Write an Adventure Module Contest." The duo's contribution won first place in the contest with Justin Langseth's Lord of the Underland serving as its only competition. The design of the game makes heavy use of Walker's design program, which has a function to pre-populate a dungeon with diverse monsters; save for the inclusion of some allies, such as a midget and a drunk, every enemy is part of Walker's pre-fabricated assortment. "The object of this quest is to find the golden ring and destroy the monster that guards it." The player begins the game standing in a rainstorm just south of the castle (no mention of the eponymous "Cronum" is found in the game) and must explore the various areas of the castle. Ultimately, through careful exploration, the player will face down a gargoyle and claim the golden ring described in the note. Windows, OSX, and Linux .zip folders containing Frank Black's PC Eamon Museum with a playable build of Cronum's Castle from eamonag.org. Zip file of the adventure from textfiles.com.